Marcus Salvius Otho (Marcus Salvius Otho Caesar Augustus, 28 April 32 AD–16 April 69 AD) was a Roman military commander who became Roman Emperor in 69 AD. He led a coup against the Emperor Galba, but was defeated in a battle by Vitellius only eight weeks later. He took his own life after the battle. The year 69 was known as the Year of the Four Emperors. ↑ Donahue, John (2004). "Roman Emperors - DIR Otho". 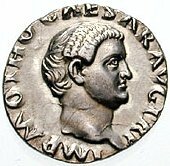 roman-emperors.org. Retrieved 13 March 2012.